Garden got you down? Outside area a bit unruly? Or simply don’t have enough time to give your garden the care and maintenance you want to give it? Before your great outdoors get out of hand, rein them in with end-to-end dedicated garden services from Jim’s Mowing Melbourne. The most trusted name in the garden maintenance business, Jim’s Mowing Melbourne will come to you and devise a plan to get your garden back on track, and your plants thriving in a good-as-new environment. We tailor our work to Melbourne’s unique climate, and respect the integrity of your plants, lawn and house when undertaking all maintenance and cleaning activities. From start to finish, Jim’s provide you a comprehensive service that has your garden looking great throughout the week. If you’re working on your garden or completing renovations, our rubbish removal service will help keep everything in check. Speak to us about an ongoing service or see how you can organise a once-off rubbish removal. We offer a hedging and pruning service for all sorts of plants, shrubs and hedges, maintaining your clean lines and edges. Included in this is the removal of old shrubs and, if needed, removal of trees for safety reasons or to make way for an extension. Allow for proper drainage and maintain the longevity of your roof with a thorough gutter cleaning service. With Jim’s, your gutters will be back to flowing again in no time, without the water and debris build-up that can place strain on the whole structure. Whether you’re looking for a once-off tidy-up or a weekly or monthly service that includes weeding and mowing, Jim’s is here to help with bespoke garden care just for your property. There’s no better first impression for your business than a well-maintained, neat and tidy garden; secure your customers’ delight before the even walk through the door. Engage Jim’s for tailored gardening services for commercial businesses, retail and more. The core of our business, lawn mowing is the key to unlocking a neat and tidy facade. Speak to Jim’s about lawn mowing for gardens of all shapes and sizes, or to get a regular service for your home or business. 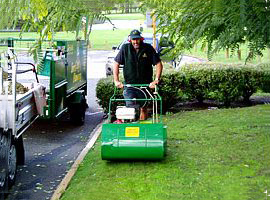 Jim’s Mowing is the Largest Mowing and Garden Maintenance Franchise System in the world, with more than 1,500 franchisees operating in Australia.This network now extends across Australia, New Zealand, Canada and the United Kingdom – in total with more than 3,800 franchises to service our customer’s needs across 50 Jim’s Group Divisions.Jim’s Mowing was founded in 1982 as a one-man business, by Jim Penman. The single biggest difference between Lawn Care and other lawn care providers boils down to one simple premise: we care more. It’s the kind of caring that can only come from being the business owner. One that lives, works, and is a part of the community they serve. We have 50 years of experience. We have the highest TrustPilot score in the industry. We’re locally owned, so there’s no big business “run-around”. With affordable prices that don’t scrimp on quality, Jim’s is your one-stop shop for quality service. Contact us for gardening in your Melbourne property, whatever suburb you live in. We’ll come to you directly and offer a no-obligation free quote on your work, plus a timeframe for when we’ll get it done. Get Your Lawn Ready for Summer! © 2018 Jim's Mowing. All Rights Reserved.